Detailed plans for a new nuclear power plant including road improvements, park and ride sites and worker accommodation will be put to the public next year. EDF Energy has announced the third consultation on its plans for Sizewell C on the Suffolk coast will start on 4 January. 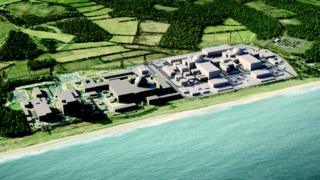 The £16bn plant would be built next to the existing Sizewell B reactor. EDF Energy said it hoped it would be the final consultation before the plans went to the Planning Inspectorate. The Suffolk Preservation Society has previously opposed the plans, saying the plant would "threaten environmental damage on an unprecedented scale". In a statement, the French government-owned company said it had spent about £100m on the project so far, along with its partner China General Nuclear (CGN). They have been involved in discussions with the UK government and 12 other parties over the raising of the investment needed to build the nuclear reactor. "Sizewell C will bring significant benefit to the East of England, jobs, education and skills development, as well as opportunities for local businesses," said Jim Crawford, Sizewell C Project Development Director. "Our sister project in Somerset, Hinkley Point C, is already delivering, with government figures showing South West companies winning contracts worth more than £1.3 billion. "We want to deliver the same benefits for the East of England," he added. The public consultation will be held in 13 parishes surrounding the village of Sizewell until the end of March next year. The second stage of the consultation finished in February 2017. EDF Energy said pending all approvals, it hoped to start building the new reactor towards the end of 2021. It is currently building Hinkley Point C, a new nuclear power station in Somerset, with CGN which is expected to open in 2025.